I can’t remember where exactly, but Goldie Hawn’s book, A Lotus Grows in the Mud was recommended to me while I was reading some respectable piece of literature, and so I ordered it and set it aside for a month or so. I finally got the chance to read it over spring break, and it was surprisingly delightful–thanks in no small part, I’m sure, to “co-author” Wendy Holden. Hawn has led a fascinating life, and her book really tries to get at some of the wisdom she’s gained in this life. And, you know what? Some of that wisdom was pretty darn inspiring and insightful. Here’s what impressed me–Hawn follows her purpose, even when it is not obvious, even when she has doubt, even when others criticize her and roadblocks threaten her faith. When I think about my purpose in life, I often have doubt and uncertainty. However, the predominant narrative one hears about one’s path is that it is easy and clear. But, that hasn’t been the case for me. I was an English major because I liked reading, but that seemed incidental. Now, I’ve made an entire career out this. I love practicing yoga because it is good for me, but a lot of times I phone it in, or have to talk myself into going, and sometimes I don’t go at all. I’m never the most flexible, most enlightened, or coolest person in the class. Still, I trained to teach yoga, and I’ve been teaching it since 2008. Most days when I enter into that classroom to teach, it feels really, really *right*. Same goes for the garden, for writing, for my friendships, for My Love. So, I loved the message of her book. She was brave. She did hard things. It made me feel like I could be brave. I could do hard things–all while making a living and having Kurt Russell unexpectedly waltz in and save me in the final hour and then stay for the remainder of my decades. Yeah, I’ll have what she’s having. In perfect timing, just as I finish this book, I see that Hawn is teaming up with Amy Schumer in a new film called Snatched. It looks lovely and hilarious, and I can’t wait to see it. I love seeing mother/daughter duos (that’s in the book too). This entry was posted in books, cooking, doula, enlightenment, existence, existentialism, family, film, garden, life, love, reading, relationships, Uncategorized, work, writing, yoga and tagged A Lotus Grows in the Mud, Amy Schumer, daughter, Goldie Hawn, Kurt Russell, mother, Snatched on March 30, 2017 by sherewin. In late spring/early summer, I saw the preview for Wiener Dog and wanted to see it. (The trailer’s great.) I didn’t imagine I would be anywhere near an independent theater during the release date, but as luck would have it, I did happen to be at the right place at the right time and got to see the film last weekend. An woman, possibly a volunteer, taking movie tickets warned us that it was a weird movie, not for everyone, she didn’t really like it, and on and on. She also started explaining the plot—but nothing that wasn’t already implied in the movie trailer. Then, before the movie began, I watched as she deterred several other movie-goers from seeing the film. In doing so, she also explained the plot of the film and this time she definitely gave away major spoilers! Fortunately, since plot doesn’t usually engage me all that much, spoilers don’t necessarily ruin a film for me. Shock over a theater working handing out spoilers aside, the film was actually pretty great. My favorite scenes were with Greta Gerwig and Ellen Burstyn (not shown together), but the other sections are worth keeping as well. The film follows the wiener dog’s impact on various lives as it gets adopted, handed off, and so forth. Each section offers some unique, horrifying, and beautiful glimpse at human nature—not an easy task, but achieved here. In terms of depth and complexity, the movie delivers. However, I did have some trouble with continuity. I don’t think I give away too much when I say that the movie starts off showing how the dog is transferred from one scenario to the next, but mid-way, that transfer is no longer documented. By the end, the viewer can’t tell if it’s supposed to be the same wiener dog. And I think it matters because my interpretation of some of the meaning in the film would have been altered by knowing if it was supposed to be the same dog throughout. Next, one could argue that the final scenario moves outside of realism. Since the film seems solidly based in realism up to that point, the shift seemed more distracting and accidental, like the film was breaking its own rules. Sure, the filmmaker broke the rule for a purpose, which was effective, but I think the film would have been more consistent throughout if it could have found a way to make the same points without delving outside of the rules of our realm. So yeah, it’s a good movie. Normally, I would probably call this dog a dachshund, but the movie will have you saying (and singing) “wiener dog.” Wiener dog. This entry was posted in film, Uncategorized and tagged ellen burstyn, film review, greta gerwig, movie review, todd solondz, wiener dog on July 20, 2016 by sherewin. I got to see The Revenant, directed by Alejandro González Iñárritu, over the weekend because Leonardo DiCaprio and Iñárritu. I started seeing previews for it last fall and knew immediately that I wanted to see it…because Leonardo DiCaprio and Iñárritu. I’ll watch DiCaprio do anything. He gets a hard time from my male peers because the women in their lives made them watch Titanic (which is a great film, by the way), and they targeted their anger at DiCaprio. He became their nemesis, and they’ve overlooked all his work since then. However, while DiCaprio is beautiful, his work as an actor absolutely stands the test of time. The Revenant is beautiful. It’s shot only with natural light. The landscapes are breathtaking. Iñárritu frequently includes long clips of running water, scan birds flying through the sky, or unset through the black silouette of a forest–the kind of stuff I would Instagram. In that way, he has a tendency toward over romanticization and daydream and, in this case, it didn’t always fit the grittiness and realness of the film. I thought Iñárritu’s Birdman was really interesting in that it broke convention, but still felt like an Aronofky film to me. Similarly, The Revenant does not break convention. If you know and love great mountain man films, like Jeremiah Johnson, you’ll notice pretty typical “mountain man tropes” from start to end. The film follows a pretty typical “mountain man movie” trope. In the film, you get a stoic man, completely competent in hunting, fire building, and surviving for months on end in high mountain blizzards. His only drive is to avenge the death of his Indian wife and children–all senselessly murdered in cold blood, of course. He eats buffalo. He contents with wolves and a grizzly. He navigates seemlessly between the friendly and the hostile Natives. He speaks several Native languages. He survives a blizzard inside the carcass of a large dead animal. He stumbles through cold mountain streams. Audiences can’t believe he’s still alive. Audiences marvel at how quickly they themselves would be dead in similar circumstances. In the beginning, the man is stripped bare, by the end it goes unimaginably further. In the end we are all wondering, what now? What was it all for? The Revenant is relentless. Some of it’s most difficult scenes are seem to never end. Despite it’s length, the film held my attention. I wasn’t dying for it to end. I was engaged throughout. This one’s worth seeing in the theater if just for the magnificent and enormous shots of landscape. This entry was posted in film and tagged Alejandro González Iñárritu, buffalo, film, film review, grizzly, grizzly attack, Leonardo DiCaprio, mountain man, movie, movie night, movie review, The Revenant, wolves on January 10, 2016 by sherewin. Let me start by quoting Cam from Modern Family, who astutely observed the following: “Excuse me, Meryl Streep could play Batman and be the right choice.” And I agree. I watched this during a movie night with my mom. She was working on her art, and I was knitting, and we made the mistake of watching it after Terms of Endearment, which is perfection and nothing else can be said about it. Netflix then suggested we watch August: Osage County directed by John Wells. This film has good acting all over the place. Each member of the stunning ensemble cast absolutely shines–as you would expect. Except there are so many other problems with the film that I started to marvel that the actors could pull off these impossible scenes. So, first: melodrama. This film is melodrama. Midway through the film, Meryl Streep is running wildly through a hay field, chased by her reticent daughter (Julia Roberts), and the audience is just sort of embarrassed, and tired, and no longer buying in (even though we wanted to! even though we love Meryl Streep and Julia Roberts!). The scene where they’re running through the field and the very long, après funeral dinner scene are so over the top that there’s no recovering. The melodrama might go over better on stage. That said, the film does deal with compelling emotional content and succeeds at pairing emotional content to characters, but struggles with putting those emotions to plot and story. The film deals with powerful stuff: struggles with addiction, unhealthy boundaries, and loving and withholding. With more subtlety, this film could have been spectacular. 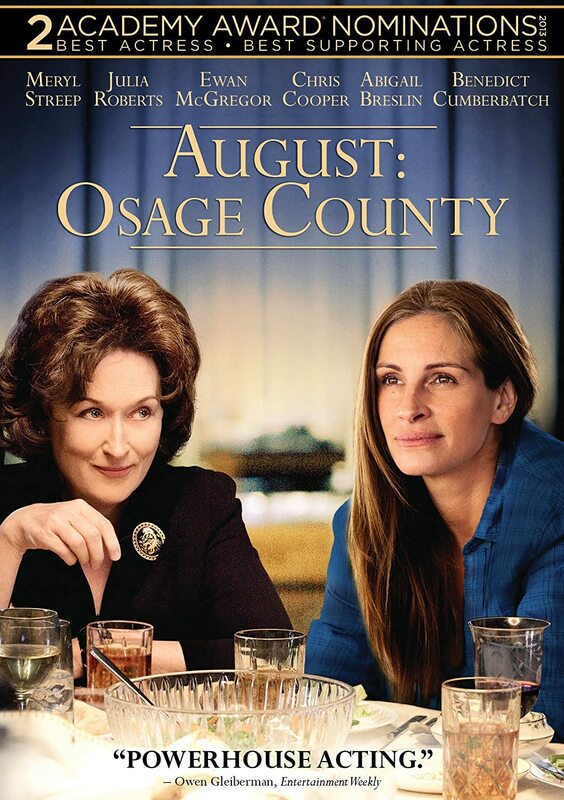 This entry was posted in family, film, Uncategorized and tagged august: osage county, film, film review, julia roberts, meryl streep, movie night, movie review on December 27, 2015 by sherewin. At this point I’ll watch Bryan Cranston do anything, which is why I went when I had a chance to see him in Trumbo, directed by Jay Roach. Diane Lane is always exquisite, and Louis CK’s in it too! This film felt long. It’s about two hours and fifteen minutes. It took me awhile to warm up to the characters. I’m a big Louis CK fan, but it took me awhile to buy him in a dramatic role. (He gets there, don’t worry.) Though the whole film felt somewhat rigid at first, it does warm up and pick up so that it is not dragging at the end. While I left the film feeling satisfied, I still think it could’ve been edited more aggressively. Politically, the “red scare,” and McCarthyism is a fascinating and disturbing (and ongoing?) part of US history. It doesn’t take much to engage me on the topic. Yet, I had a hard time getting into this film. That said, it is worth watching. Because it picks up. Because it’s beautiful. Because it rises to something interesting and important. Now, let me break it down. First, the smoke. These people are smoking constantly, and the cinematographer is having some fun with it. There are these glorious shots of white smoke swirly slowly and intricately around people’s faces. There’s a smoke shot toward the end that is absolutely over the top. Thick white smoke swirls through each grain of thick, gray mustache hair, and it’s both repulsive and lovely and artful. And on that note, I’ll also talk about Bryan Cranston’s physicality—something I think he’s understood for his entire acting career. (I first noticed it in his Malcolm in the Middle days). He, more than anyone, knows the power of an ordinary middle-aged man wearing tighty whiteys, and he’s not afraid to use it. Finally, the design. This was L.A. in the 1940s and 1950s. Every couch, every glass of water, and every earring is on point. I was busy watching the design elements while I waited for characters to develop and the plot to pick up, and that was more than enough to keep me satisfied. This entry was posted in film, Uncategorized, writing and tagged bryan cranston, film, film review, movie review, trumbo on December 14, 2015 by sherewin. 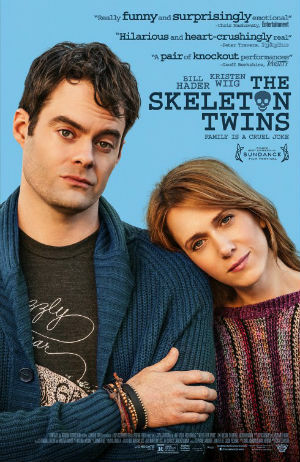 Kristen Wiig and Bill Hader are amazing in this film. They have a ton of chemistry and that probably goes back to their days together at Saturday Night Live. If you’re me, and you’re a fan of SNL, and you’re a fan of Bill Hader and Kristen Wiig, you’ll love watching these two together on screen. Comedy actors can really excel at drama, and you see that in The Skeleton Twins. Before I saw the film, I was told by a trusted person that it was “good, but dark.” And, that’s true. My mind goes in a million directions when someone says “dark,” and it really wasn’t so dark as all that, but it is a heavy film. It’s about twins who are desperately struggling in their lives. They are estranged, but the reasons are unclear throughout most of the film. Toward the end, catalyst for their decade-long estrangement slowly unfolds. The acting is great. The characters are unique and real. (Luke Wilson is really good in this too!) The plot, writing, and direction are all unique and nuanced and good. However (HOWEVER! ), I don’t think the film addresses a universal truth, and that’s something I think good film should do. I left the film thinking, “Yeah, it’d be nice to have a twin that is tuned in to me in my times of suffering, a twin who holds the key to cheering me up when I am down, but I don’t have a twin, and most of us don’t have a twin.” Life is long and hard—we see that in the film. Unlike the Wiig and Hader’s struggling characters, the rest of us have to schlog through this life alone. Maybe if we’re lucky we have some parents, a sibling or two, a few close friends. But very few of us have a twin. Somehow this film reminded me of Broken Flowers—also critically acclaimed and good in so many ways (and Jarmusch! )—but lacking, in my view, of a universal truth or experience. The films look very closely a unusual circumstances. Now, this isn’t to write the film(s) off entirely. For some people, this story (and fabulous acting) is enough. I’m finding, though, that I want my films to get at something more universal—something that is moving me and something I know is moving my fellow audience members as well. This entry was posted in art, existence, existentialism, film, life and tagged Bill Hader, Broken Flowers, Craig Johnson, film review, Jarmusch, Kristen Wiig, Luke Wilson, movie review, Saturday Night Live, SNL, The Skeleton Twins on September 24, 2015 by sherewin. 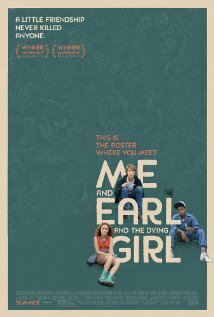 Me and Earl and the Dying Girl is a very Sundance-y Sundance movie, but it’s good! Sundance loves some great films, and this is one of them. First, this is indeed a movie about a dying girl. Because the title is so straightforward, I somehow thought it wouldn’t be so dark, but it was. I also rewatched Mad Max: Fury Road this week (stay with me, it’s relevant!) and have continued to find meaning in the war boys’ concept of a “witness”—this idea of being witnessed in our acts of bravery, our acts of love, our acts of dying—all of it. It’s meaningful to me because I’ve always been so independent and only in the last few years have begun to understand the value of an invested witness. I mention it because an important aspect of M&E&DG is that a very young man is witness to a dying girl. It’s something they stumble into, they resist, but, of course, it becomes meaningful in ways they couldn’t’ve anticipated or even previously comprehended. That kind of character growth and insight was lovely to watch, but it was also sophisticated enough that I think most audience members come away with deeper insights about what it means to connect more to “their people,” moving beyond assumptions and into really knowing another person. One of the best moments in the film is when the cool history professor talks about how he lost his father at a young age. He said that even after his father’s death, he’s continues to learn about him. His father’s life continues to reveal itself. It started when his dad’s friends started sharing stories after his death. It continues all the time, in unimaginable ways, even decades later. I think the point here is that learning about our dead loved ones is part of what it means to be alive and self-aware. As for me, I continue to learn about my own grandmothers. Both my great grandmother and her daughter (my mom’s mom) were a huge part of my early childhood. My great grandma even lived with us sometimes during the winter. She just stayed. She was Swedish. She was very quiet, and she loved me. My grandma and great grandma died within two years of each other. They were a big part of my childhood, and then, in a relatively short period of time, they were both gone. For awhile, it was sad, but okay, and this is the natural cycle of life. And then, I got really curious about them and asked my mom and aunties lots of questions about who my grandmothers were. I began to piece together my memories with their stories. Over time, I can see how much the course of my life has been shaped by their influence. Decades later, I’ll remember idioms and wisdom about how to grow a garden, how to love one man. They suffered and loved for decades, and don’t we all? I am a witness to it all. There is meaning where meaninglessness wants to creep in. It reminds me that I am part of something bigger, family, culture, blood, brains. They are with me in memory and in my story, and that’s what I took away from M&E&DG. This entry was posted in existence, family, film, life, relationships and tagged Alfonso Gomez-Rejon, film review, Me and Earl and the Dying Girl, movie review, Sundance on September 5, 2015 by sherewin. The Imitation Game, starring Benedict Cumberbatch, depicts a fascinating part of human history when war-time code encryption lead to massive breakthroughs in computing. This was thanks in no small part to the genius of Alan Turing. Understanding this history seems even more important when I think of the pervasive role of computers in my daily life: the bane and the joy. The history alone is deserving of a film. I would’ve loved to see even more details about how the early encryption machines worked and how the cryptologists did the work of encryption. The audience sees that they are working through a process of elimination within the limit of an 18-hour period. I’m sure that this is plenty of detail for an audience, but I was curious to know more. I also wanted to know more about how the “computer” worked–though the audience does get some idea of how the machine worked with algorithms and trial by elimination to crack the code. In my view, Benedict Cumberbatch absolutely earned an Oscar, portraying a convincing (and interesting!) emotional transformation throughout the film. The film goes a bit awry when it forces some emotional drama and personal upheaval between Turing and Clarke, which seemed particularly forced. It follows the conventional romantic comedy pattern of connection, disagreement, and then reconnection. To be fair, Clarke and Turing’s relationship gets a bit more complicated toward the end of the film. What’s really interesting is Turing’s emotional attachment to his childhood friend. That inner turmoil is unique and moving and, in my view, would’ve provided enough emotion to carry the film. Like the innovations in computing technology, in the relationship between Turning and Christopher, we see something new, unexpected, and complex. This entry was posted in film and tagged Alan Turing, benedict cumberbatch, code encryption, movie review, movies, the imitation game on August 18, 2015 by sherewin. As I mentioned in the previous post, I’ve been absolutely blown away by the response to the new Mad Max: Fury Road film. The critics absolutely adore this film, and early on started claiming that the film is feminist. Social media has been blowing up with articles about the film. Mostly, I’ve been surprised and pleased that everyone else is noticing what, for a long time, felt like my own little secret. Beyond that, I’ve been a little uncertain about the most pervasive argument. which is that the film is feminist. While there are many forms of feminism, and this film might encompass some of those interpretations, I’m not entirely convinced that this is a feminist film. In my view, simply adding female characters, and even a female lead, is not enough to make it feminist. According to the Bechdel test, a movie has to have A) at least two women, who B) talk to each other, about C) something besides a man. Of course it’s shocking that so few films can pass the Bechdel test, but, in my opinion, just passing the Bechdel test is not enough to make it a feminist film. It’s just enough to make it not “problematic” and maybe not sexist. Sadly, however, with so few women represented in film, maybe this is all it takes to earn the “feminist” label. I, however, want a little more. Yes, Fury Road has female characters, and yes they talked to each other, but did they ever talk about anything besides men—their captors who kept them in chains? Maybe a little bit. Not really. Their entire raison d‘être is a reaction to the men in power. The film is about reacting to a corrupt and toxic system of power, so maybe that could be construed as feminist, but a better reaction to the corrupt political system was never clearly defined (though perhaps implied here and there). We see women acting out of desperation. In my view, the film is mostly about a strong female lead with an action/reaction that may not be clearly feminist, but is (at least) not incredibly sexist. This entry was posted in film and tagged Bechdel test, Charlize Theron, feminism, feminist, feminist film, Mad Max, Mad Max Fury Road, movie review, new Mad Max film on June 2, 2015 by sherewin.